Provides Extreme Energy For Up To 6 Hours! Tired? Need Energy? 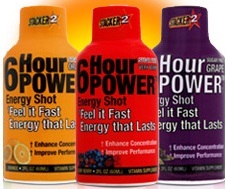 Get 6 Hour Power Extreme Energy Shots. Feel it Fast! Energy that Lasts! The delicious 2oz shot comes in tangy Lemon Lime, Sweet Very Berry. All flavors are sugar free. Note: Nutritional content and ingredients may vary slightly between flavors.